Life with your hybrid Honda had been going well for several years now. You had been enjoying the expected savings at the pump and maintenance costs have been routine and budget-friendly. 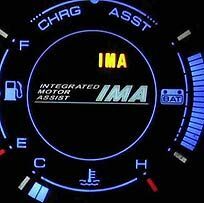 Then it happened: the IMA light on your vehicle’s control panel suddenly lit up, like a bad beacon cutting through your bliss. Don’t panic. That IMA light (integrated motor assist) is merely reminding you of the hard fact that your hybrid’s battery does not last for the lifetime of your vehicle. Honda Insight hybrids, for example, have been on the road for over a decade now, so it’s not surprising that to keep your aging hybrid rolling down the highway, you can expect to invest in a new battery pack. Even though you’ve likely enjoyed lower maintenance costs and have been saving at the pump all these years, the idea of shelling out a couple grand to purchase and install a new battery pack can be a bit jarring. Keep in mind as well that even if the IMA light on your car hasn’t cried out for help yet, you could be losing some performance with an aging battery. If your IMA light has indeed turned on, the first thing you probably want to do is check for any available warranties that might apply to your vehicle. Honda, like most hybrid automakers, has become much more lenient in recent years as far as covering battery replacement as long as the IMA light indicates there is a problem. Several automakers have started to come out with greatly extended battery warranties in the past year, with some even providing lifetime warranties. But if you have racked up quite a number of miles on your Honda already, or you have an older model, you are less likely to find help shouldering the cost. To understand what’s going on with your Honda hybrid’s battery, it’s helpful to understand how these batteries work. The 144V high-voltage nickel metal hydrid battery at home in the first-generation Honda Insights and Civics is actually comprised of 120 individual battery cells connect in a series. Your battery contains 20 individual battery packs, sometimes called sticks, that are made up of six cells each. While these individual cells are actually D cells, these aren’t the type of D cells you’ll find in your household flashlight. Because these cell need to handle very high charge and discharge currents to meet your vehicle’s demands and the challenging automotive environment in genera, they are special industrial-strength D cells. As your battery ages, it begins to deteriorate over the years, eventually causing your IMA light to come on and even for your hybrid system to fail. When the individual cells start to age, they can do so at different rates, compounding the problem of performance, causing battery pack imbalance where cells are operating at variable charges throughout the pack. What does this mean for you? Like many things in life, your battery pack is only as strong as its weakest link–in this case, its weakest cell. That means the lifespan of your battery pack can be impacted because of just one cell that has been affected by driving conditions or habits, or environmental conditions, in variable ways. While all this is going on, your car’s computers are monitoring your pack’s performance to asses its condition. Your battery “state of charge gauge” can suddenly go empty, meaning your car’s computer has identified a subpack within your battery that has a lower charge than anticipated, which is sometimes known as negative recalibration. It doesn’t matter if the rest of your battery pack is in good condition. The important thing to watch for when it comes time to replace your Honda Civic or Insight battery, is quality of your replacement. You will be hard-pressed to find a quality battery replacement for less than about $2,000. The challenging part is, you can also get stuck with a battery of dubious quality. Many services offering battery replacement for your Honda hybrid will actually install used, refurbished, rebuilt or re-balanced batteries. When it comes time to replace your hybrid’s battery, either because your IMA light has come on or you have seen performance deteriorate, look for battery replacement that guarantees new cells throughout, not just refurbished parts. Also, look for a service that offers a warranty for your new battery. Beware of battery replacement services that won’t guarantee new parts and offer no warranty. Invest wisely in your hybrid’s continued years of performance.